Nothing too impressive, nothing too original, but it does its job. That basically is the best way to describe this movie, that is a watchable- but certainly not a truly recommendable one as well. Thing with this movie is that it is obviously trying to be as simplistic as possible, but it is this very same simplicity that works against the movie- and is the thing that is keeping it down at times. Its simplicity, among other things, ensures that the movie remains a rather predictable one and it does very little to try and surprise. But what is worse is that its simplicity prevents the movie from ever truly working out as an effective and very memorable movie. The movie is mostly talk, without showing you too much of anything. This would have been fine, as long as the characters would have worked out as solid and interesting enough ones. This however really isn't the case. The characters (of which there are only two really) remain a bit too shallow all throughout, despite the movie its hard efforts. They never go through any interesting enough transitions and we basically know far too little about their background, history and personalities to truly genuinely care. It makes the movie fairly shallow and devoid of any good drama, without ever turning into a truly terrible drama as well though. And yes, this movie really is a drama. Wasn't too sure what to expect of this movie beforehand, but its cover and story-line made it seem like an action flick as well, which it however clearly isn't though. There is no action in this movie, no real thriller aspects but instead a simple and humble story of two people open up to each other and starting an unusual and unlikely friendship. Probably still sounds pretty appealing and interesting to some and indeed, it is a pretty decent little movie to watch, but just don't expect anything too exceptional or surprising. 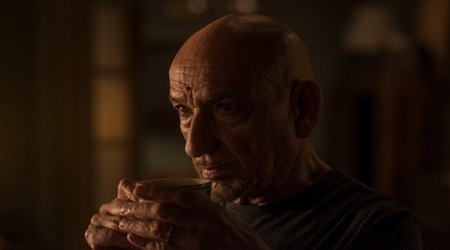 It is weird to see Ben Kingsley's career slowly developing into one that consists out of small, low-budget movies, that often go straight to DVD as well. He is never terrible and his newer movies certainly also aren't the worst to watch, but it is just that he is an actor who I always have had a high regard of. Seeing him in these small and 'insignificant' movies just seems like a giant waste to me. I mean, this is the guy who played Ghandi and was in "Schindler's List" at one point in his career. It is a movie I don't regret watching, but I also most certainly can't wholeheartedly recommend it. A tad bit too simplistic and shallow for it to ever work out as anything truly effective and memorable, though all of the right intentions and ingredients were obviously there.